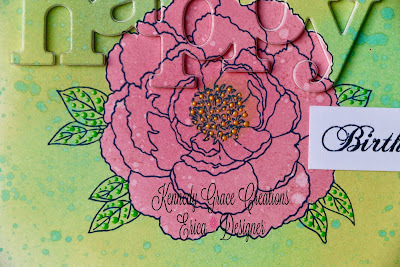 Hello and welcome to the Kennedy Grace Creations blog this fine day! Today I have a fun and different card for you as I tried something out with my new Distress Oxide inks and I thought I'd share it with you. 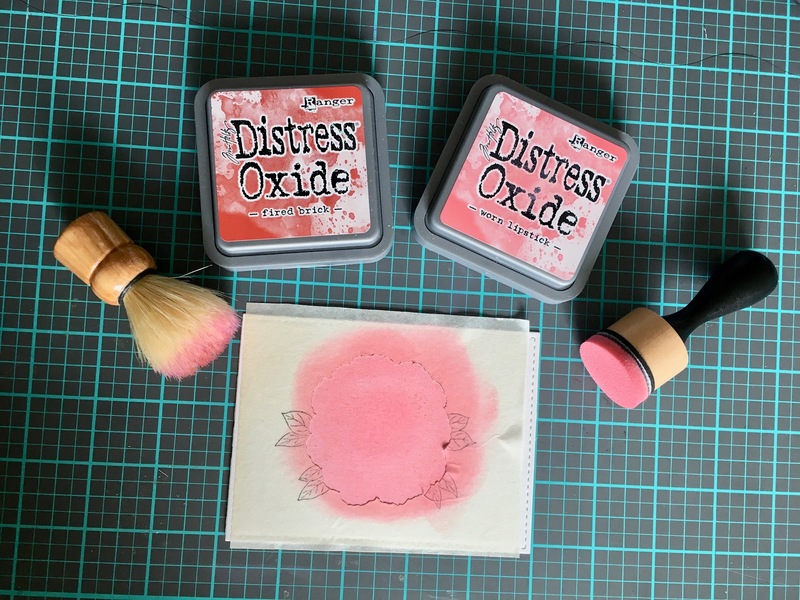 I have been playing with different ways of using them and this was a successful attempt, it's a back-to-front distress ink blending thing... ish... sorta. First off I die cut a panel in Strathmore Bristol Vellum water colour card stock which was going to be the front part of the card. 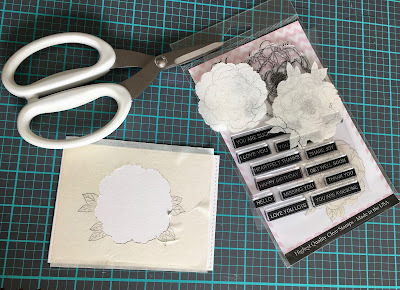 Then I got the Just A Rose stamp set out and stamped it on a large piece of masking film, using a craft scalpel I cut out the rose part only. Are you getting where I'm going with this? Yeah? Can you see it? As I was doing a flower I decided to use Worn Lipstick and blended it over the "flower hole". I thought the flower needed a little bit of detail so I dabbled a little bit of Burnt Brick using a brush to created tiny, tiny details. I also flicked some water droplets on it and mopped them up using a towel. After I was done with the flower, I pulled the masking film off the panel and used the flower masking film part to cover up my rose. Then I blended Cracked Pistachio and Peeled Paint all around it to create a green bush. I didn't cover the whole panel and wasn't too bothered about getting a smooth coverage as I was going to splatter more water on it. When it came time to do the splattering I decided against the water, instead I smooched some Cracked Pistachio on my craft mat, sprayed some water on it and picked it up with my splatter brush (this is a totally essential tool I will have you know) It's possible I went to town with the green splatters but eh, life is short so lets live on the edge! As May is my birthday month, I went with yet another birthday card. So sue me, lol! 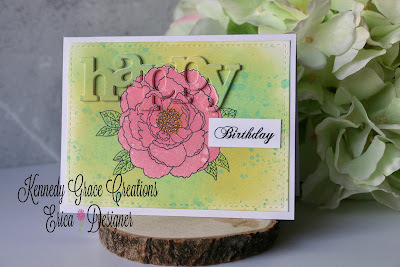 I used a 'Happy' word die from Winnie & Walter and cut it out at the top left corner. To make it pop I also cut another one out in foam and adhered it all to the panel, which I also adhered to a card base. On a small white banner I stamped the word 'Birthday' from the Beautiful Bloom-Sweet Rose sentiments and I added this under the 'Happy' die. Well, that's it for me today but I hope that you might give this technique a try. It's great fun! Happy crafting and belated Happy Mother's Day to those who celebrated yesterday! Bye from Erica, you can find me on Instagram here and Kennedy Grace Creations here. Don't forget to follow and give us some love. 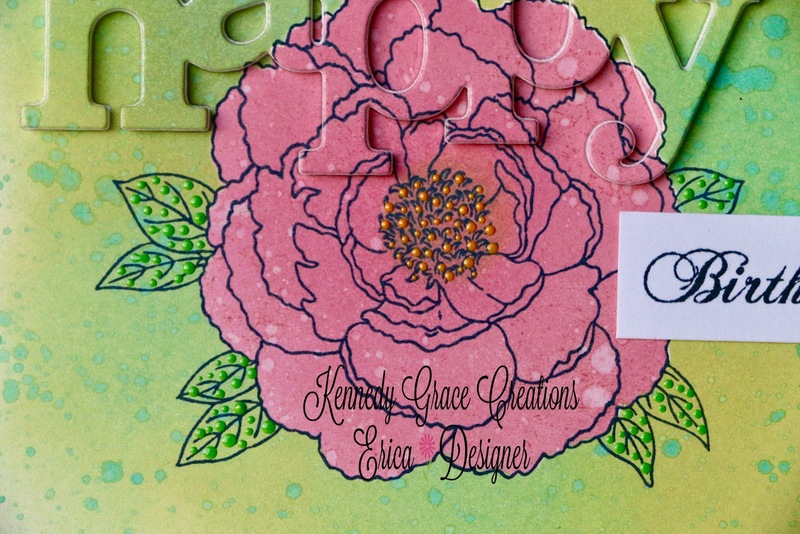 Any goodies you want, you can find at the Kennedy Grace Creations shop.